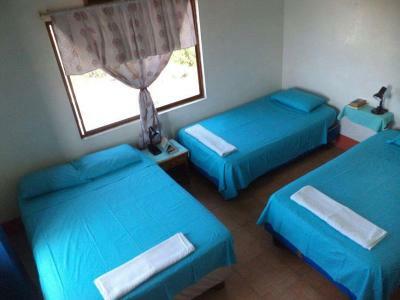 Consiga um excelente preço em Posada del Caminante - pontuação de 8,2 dada por hóspedes recentes. They wash your clothes for free and there are free bananas which was great. 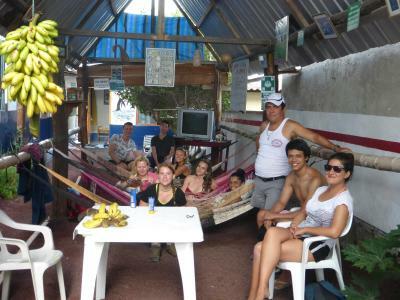 Perfect hostel on Santa Isabella for Backpackers, good equipped kitchen, very nice and quiet area with hammocks for relaxing, our room was huge and with a refridgerator, all the stores around there with what you´d call reasonable prices for galapagos and only a 5 - 10 min walk to the beach, a bit longer if you want to go snorkling. Very, very friendly staff - they lent us some of the snorkling equipment for free. Though our room didn’t have WiFi or soap, Joseph was very friendly and helpful. The facilities are okay, but the host is really great and location is very convenient! Room was very clean, spacious and comfortable. Breakfast was very nice as well. The hammocks in the garden , good shower! They give me a fan on the room, free fruit and water! Good price. They also do free laundry for you every morning. Great view for the sunset on the Roof. Free water, oranges and bananas all the time. The hammacs area pretty cool to chill. And the really accesible and beautiful Diana. Very kind nad helpfull stuff, Free water, fruits, laundry. "They wash your clothes for free and there are free bananas which was great. " "It was great having free Bananas and free laundry! Would totally stay there again"
"Perfect hostel on Santa Isabella for Backpackers, good equipped kitchen, very nice and quiet area with hammocks for relaxing, our room was huge and with a refridgerator, all the stores around there..."
"Though our room didn’t have WiFi or soap, Joseph was very friendly and helpful. The facilities are okay, but the host is really great and location is very convenient!" 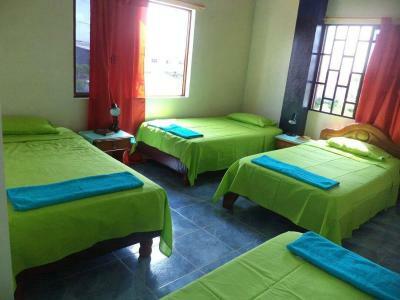 "Room was very clean, spacious and comfortable. Breakfast was very nice as well." "The place was very clean, room was spacious and very comfortable , and breakfast was very nice as well"
"The hammocks in the garden , good shower! They give me a fan on the room, free fruit and water!" "Good price. They also do free laundry for you every morning." "Great view for the sunset on the Roof. Free water, oranges and bananas all the time. The hammacs area pretty cool to chill. And the really accesible and beautiful Diana." 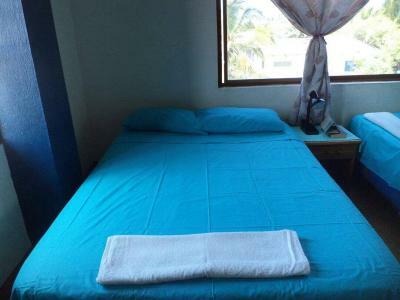 "Very kind nad helpfull stuff, Free water, fruits, laundry." Quartos práticos com acesso Wi-Fi gratuito estão disponíveis na Ilha de Galápagos, a 400 metros da praia. A Posada del Caminante fica a 100 metros do mercado da cidade e a 4 km do Vulcão Tomas. Os hóspedes poderão usufruir de uma cozinha partilhada e de frutas frescas gratuitas. O Del Caminante tem quartos com televisão e frigoríficos. Os quartos têm casas de banho privativas ou partilhadas com água quente a qualquer hora. Alguns quartos incluem comodidades de cozinha. Estão disponíveis serviços de lavandaria. O Aeroporto de Seymour fica a 30 km. Esta é a parte de Puerto Villamil que os hóspedes preferem, de acordo com comentários independentes. Este alojamento é recomendado pela boa relação preço/qualidade em Puerto Villamil! Os hóspedes têm mais por menos dinheiro em comparação a outros alojamentos nesta cidade. Posada del Caminante dá as boas-vindas a hóspedes de Booking.com desde 21 de Nov de 2012. Em que período gostaria de hospedar-se em Posada del Caminante? Quarto prático, com uma televisão, um frigorífico e uma casa de banho partilhada com água quente durante todo o dia. Quarto prático com uma televisão, um frigorífico e uma casa de banho partilhada com água quente durante todo o dia. O quarto também dispõe de cozinha. Informação essencial Posada del Caminante aceita pedidos especiais -adicione-o(s) no próximo passo! Grátis! Uma criança com menos de 3 ano(s): será acomodado(a) sem custos adicionais pelo uso da cama existente. Os cartões de crédito são necessários apenas para garantir a sua reserva . Por favor, note que o trajecto entre o Aeroporto Balta na Ilha de Santa Cruz e a Posada del Caminante implica uma viagem de carro de cerca de 1 hora até Puerto Ayora e em seguida uma viagem de cerca de 2 horas num barco local para Puerto Villamil Isabela. Os barcos partem diariamente às 14:00h, por favor confirme o horário no local. 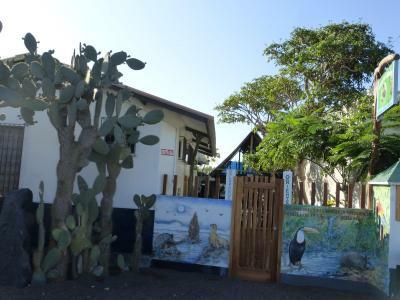 "Perfect hostel on Santa Isabella for Backpackers, good equipped kitchen, very nice and quiet area with hammocks for relaxing, our room was huge and with a refridgerator, all the stores around there with what you´d call reasonable prices for galapagos and only a 5 - 10 min walk to the beach, a bit longer if you want to go snorkling. 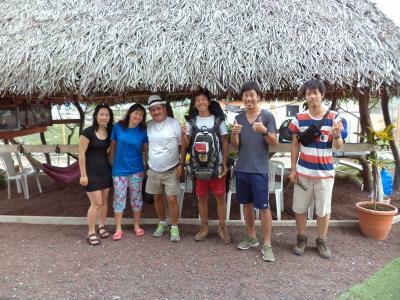 Very, very friendly staff - they lent us some of the snorkling equipment for free." 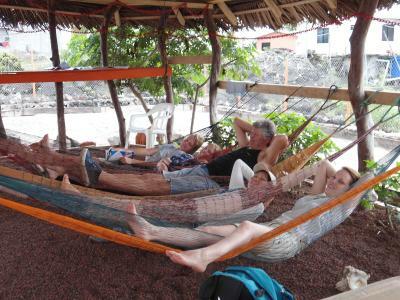 "The hammocks in the garden , good shower! They give me a fan on the room, free fruit and water! " "Muito bom custo x benefício"
Apesar de o banheiro ser dentro dos quartos ele é aberto por cima.